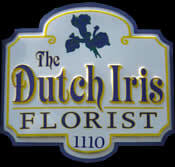 Welcome to the Dutch Iris Florist! We are a family owned and operated business. Our creative staff has more than 125 years of combined experience in the floral and event industry. And we are proud to say that we have been voted the best florist in Harnett County for eight years in a row.